Working Song is a gathering of hearts and hands. We are based on the northern Olympic Peninsula, in the Port Townsend & Jefferson County area. Work is joyful, and we can do beautiful things with our hands while we sing together. This gathering is Song grounded in crafts, buildings, and gardens, and is meant for those who wish to speak and sing with each other about how we live in the world today, how to be bridges in our fractured culture. This gathering is also for those simply wanting to learn a craft or skill in a supportive learning environment. All skills levels are welcome, and all are welcome to participate as much or as little as meets their current gusto. How do we become bridges thru music, and thru material? All songs have a "job" they are here to do - the good morning songs, the gratitude songs, the meal blessing songs, the birthday songs, house building song; songs for cultural movements, human passions, and rituals; and the many songs celebrating the small and big and beautiful things in our life and of the world. Every song and every person is coming as a teacher and a participant. Everyone involved has an opportunity to ask "what is my intension?" and enact it here. We began as a seasonal gathering. In the winter: learning crafts and vision for the year, in the spring: planting trees and tending the land, in the summer: barn raising and creating buildings, in the autumn: processing seeds and herbs. This is not about working quickly, or perfectly (though we may), we are generating a new culture of work - where the priority is joy, connection, healing, empowerment, and leadership. Creative force comes from within and is made visible through our work. Using our Voice is a creative act, and act of will, and of love. Using our hands helps us metabolize the love we feel in the physical world, through our physical bodies, connecting with the Creative material world in which we are all a part. Working Song is resting. We re-organizing and will return as ourselves or something new in 2018. Thank you everyone for rich beginnings. 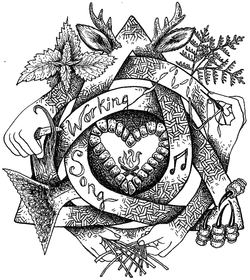 Send an e-mail to info@placecraft.org if you would like to stay in the loop about current Working Song Gatherings, to inquire about hosting Working Song where you live, or as a part of an already existing gathering.